This document was published by the HTML Working Group as an Editor's Draft. If you wish to make comments regarding this document, please send them to public-html-media@w3.org (subscribe, archives). All feedback is welcome. Provide byte stream definitions for WebM & the ISO Base Media File Format. A sequence of bytes that contains all of the initialization information required to decode a sequence of media segments. This includes codec initialization data, Track ID mappings for multiplexed segments, and timestamp offsets (e.g. edit lists). The concatenation of the the EBML Header, Segment Header, Info element, and Tracks element. A sequence of bytes that contain packetized & timestamped media data for a portion of the presentation timeline. Media segments are always associated with the most recently appended initialization segment. A moof box followed by one or more mdat boxes. A hypothetical buffer that contains a distinct sequence of initialization segments & media segments. When media segments are passed to append() they update the state of this buffer. The source buffer only allows a single media segment to cover a specific point in the presentation timeline of each track. If a media segment gets appended that contains media data overlapping (in presentation time) with media data from an existing segment, then the new media data will override the old media data. Since media segments depend on initialization segments the source buffer is also responsible for maintaining these associations. During playback, the media element pulls segment data out of the source buffers, demultiplexes it if necessary, and enqueues it into track buffers so it will get decoded and displayed. buffered describes the time ranges that are covered by media segments in the source buffer. The set of source buffers that are providing the selected video track, the enabled audio tracks, and the "showing" or "hidden" text tracks. This is a subset of all the source buffers associated with a specific MediaSource object. See Changes to selected/enabled track state for details. 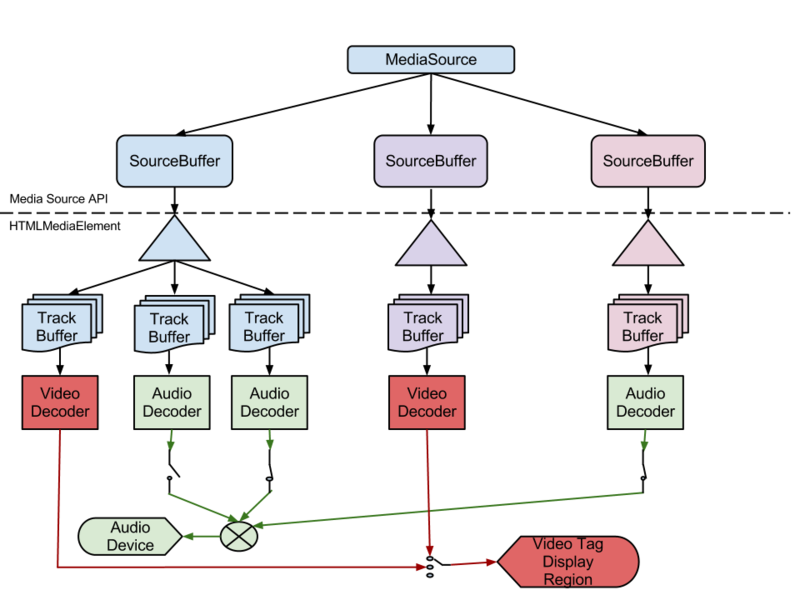 A hypothetical buffer that represents initialization and media data for a single AudioTrack, VideoTrack, or TextTrack that has been queued for playback. This buffer may not exist in actual implementations, but it is intended to represent media data that will be decoded no matter what media segments are appended to update the source buffer. This distinction is important when considering appends that happen close to the current playback position. See Source Buffer to Track Buffer transfer for details. The presentation start time is the earliest time point in the presentation and specifies the initial playback position and earliest possible position. All presentations created using this specification have a presentation start time of 0. Appending media segments with negative timestamps will cause playback to terminate with a MediaError.MEDIA_ERR_DECODE error unless timestampOffset is used to make the timestamps greater than or equal to 0. A MediaSource object URL is a unique Blob URI created by createObjectURL(). It is used to attach a MediaSource object to an HTMLMediaElement. These URLs are the same as what the File API specification calls a Blob URI, except that anything in the definition of that feature that refers to File and Blob objects is hereby extended to also apply to MediaSource objects. A byte stream format specific structure that provides the Track ID, codec configuration, and other metadata for a single track. Each track description inside a single initialization segment must have a unique Track ID. A unit of compressed media data that has a presentation timestamp and decode timestamp. The presentation timestamp indicates when the frame should be rendered. The decode timestamp indicates when the frame needs to be decoded. If frames can be decoded out of order, then the decode timestamp must be present in the bytestream. If frames cannot be decoded out of order and a decode timestamp is not present in the bytestream, then the decode timestamp is equal to the presentation timestamp. The subsections below outline the buffering model for this proposal. It describes how to add and remove source buffers from the presentation and describes the various rules and behaviors associated with appending data to an individual source buffer. At the highest level, the web application simply creates source buffers and appends a sequence of initialization segments and media segments to update the buffer's state. The media element pulls media data out of the source buffers, plays it, and fires events just like it would if a normal URL was passed to the src attribute. The web application is expected to monitor media element events to determine when it needs to append more media segments. SourceBuffer objects can be created once a MediaSource object enters the "open" state. The application calls addSourceBuffer() with a type string that indicates the format of the data it intends to append to the new SourceBuffer. If the user agent supports the format and has sufficient resources, a new SourceBuffer object is created, added to sourceBuffers, and returned by the method. If the user agent doesn't support the specified format or can't support another SourceBuffer then it will throw an appropriate exception to signal why the request couldn't be satisfied. Removing a SourceBuffer with removeSourceBuffer() releases all resources associated with the object. This includes destroying the all the segment data, track buffers, and decoders. The media element will also remove the appropriate tracks from audioTracks, videoTracks, & textTracks and fire the necessary change events. Playback may become degraded or stop if the currently selected VideoTrack or the only enabled AudioTracks are removed. Updating the state of a source buffer requires appending at least one initialization segment and one or more media segments via append(). The following list outlines some of the basic rules for appending segments. The first segment appended must be an initialization segment. All media segments are associated with the most recently appended initialization segment. A whole segment must be appended before another segment can be started unless abort() is called. Segments can be appended in pieces. (i.e. A 4096 byte segment can be spread across four 1024 byte calls to append()). If a media segment requires different configuration information (e.g. codec parameters, new Track IDs, metadata) from what is in the most recently appended initialization segment, a new initialization segment with the new configuration information must be appended before the media segment requiring this information is appended. A new media segment can overlap, in presentation time, a segment that was previously appended. The new segment will override the previous data. Media segments can be appended in any order. In practice finite buffer space and maintaining uninterrupted playback will bias appending towards time increasing order near the current playback position. Out of order appends facilitate adaptive streaming, ad insertion, and video editing use cases. The media element may start copying data from a media segment to the track buffers before the entire segment has been appended. This prevents unnecessary delays for media segments that cover a large time range. The number and type of tracks must be consistent across all initialization segments. For example, if the first initialization segment has 2 audio tracks and 1 video track, then all initialization segments that follow, for this SourceBuffer must describe 2 audio tracks and 1 video track. Track IDs do not need to be the same across initialization segments only if the segment describes one track of each type. For example, if an initialization segment describes a single audio track and a single video track, the internal Track IDs do not need to be the same. Track IDs must be the same across initialization segments if multiple tracks for a single type are described. (e.g. 2 audio tracks). Codecs changes are not allowed. For example, you can't have an initialization segment that specifies a single AAC track and then follows it with one that contains AMR-WB. Support for multiple codecs is handled with multiple SourceBuffer objects. Video frame size changes are allowed and must be supported seamlessly. This will cause the <video> display region to change size if you don't use CSS or HTML attributes (width/height) to constrain the element size. Audio channel count changes are allowed, but they may not be seamless and could trigger downmixing. All timestamps must be mapped to the same presentation timeline. Segments must start with a random access point to facilitate seamless splicing at the segment boundary. Gaps between media segments that are smaller than the audio frame size are allowed and must not cause playback to stall. Such gaps must not be reflected by buffered. Once a new SourceBuffer has been created, it expects an initialization segment to be appended first. This first segment indicates the number and type of streams contained in the media segments that follow. This allows the media element to configure the necessary decoders and output devices. This first segment can also cause a HTMLMediaElement.readyState transition to HAVE_METADATA if this is the first SourceBuffer, or if it is the first track of a specific type (i.e. first audio, first video track, or first text track). If neither of the conditions hold then the tracks for this new SourceBuffer will just appear as disabled tracks and won't affect the current HTMLMediaElement.readyState until they are selected. The media element will also add the appropriate tracks to the audioTracks, videoTracks, & textTracks collections and fire the necessary change events. The description for append() contains all the details. If a media segment is appended to a time range that is not covered by existing segments in the source buffer, then its data is copied directly into the source buffer. Addition of this data may trigger HTMLMediaElement.readyState transitions depending on what other data is buffered and whether the media element has determined if it can start playback. Calls to buffered will always reflect the current TimeRanges buffered in the SourceBuffer. There are several ways that media segments can overlap segments in the source buffer. Behavior for the different overlap situations are described below. If more than one overlap applies, then the start overlap gets resolved first, followed by any complete overlaps, and finally the end overlap. If a segment contains multiple tracks then the overlap is resolved independently for each track. The figure above shows how the source buffer gets updated when a new media segment completely overlaps a segment in the buffer. In this case, the new segment completely replaces the old segment. The figure above shows how the source buffer gets updated when the beginning of a new media segment overlaps a segment in the buffer. In this case the new segment replaces all the old media data in the overlapping region. Since media segments are constrained to starting with random access points, this provides a seamless transition between segments. When an audio frame in the source buffer overlaps with the start of the new media segment special behavior is required. At a minimum implementations must support dropping the old audio frame that overlaps the start of the new segment and insert silence for the small gap that is created. Higher quality implementations may support crossfading or crosslapping between the overlapping audio frames. No matter which strategy is implemented, no gaps are created in the ranges reported by buffered and playback must never stall at the overlap. The figure above shows how the source buffer gets updated when the end of a new media segment overlaps a segment in the buffer. In this case, the media element tries to keep as much of the old segment as possible. The amount saved depends on where the closest random access point, in the old segment, is to the end of the new segment. In the case of audio, if the gap is smaller than the size of an audio frame, then the media element should insert silence for this gap and not reflect it in buffered. An implementation may keep old segment data before the end of the new segment to avoid creating a gap if it wishes. Doing this though can significantly increase implementation complexity and could cause delays at the splice point. The key property that must be preserved is the entirety of the new segment gets added to the source buffer and it is up to the implementation how much of the old segment data is retained. The web application can use buffered to determine how much of the old segment was preserved. The figure above shows how the source buffer gets updated when the new media segment is in the middle of the old segment. This condition is handled by first resolving the start overlap and then resolving the end overlap. The source buffer represents the media that the web application would like the media element to play. The track buffer contains the data that will actually get decoded and rendered. In most cases the track buffer will simply contain a subset of the source buffer near the current playback position. These two buffers start to diverge though when media segments that overlap or are very close to the current playback position are appended. Depending on the contents of the new media segment it may not be possible to switch to the new data immediately because there isn't a random access point close enough to the current playback position. The quality of the implementation determines how much data is considered "in the track buffer". It should transfer data to the track buffer as late as possible whilst maintaining seamless playback. Some implementations may be able to instantiate multiple decoders or decode the new data significantly faster than real-time to achieve a seamless splice immediately. Other implementations may delay until the next random access point before switching to the newly appended data. Notice that this difference in behavior is only observable when appending close to the current playback position. The track buffer represents a media subsegment, like a group of pictures or something with similar decode dependencies, that the media element commits to playing. This commitment may be influenced by a variety of things like limited decoding resources, hardware decode buffers, a jitter buffer, or the desire to limit implementation complexity. Here is an example to help clarify the role of the track buffer. Say the current playback position has a timestamp of 8 and the media element pulled frames with timestamp 9 & 10 into the track buffer. The web application then appends a higher quality media segment that starts with a random access point at timestamp 9. The source buffer will get updated with the higher quality data, but the media element won't be able to switch to this higher quality data until the next random access point at timestamp 20. This is because a frame for timestamp 9 is already in the track buffer. As you can see the track buffer represents the "point of no return." for decoding. If a seek occurs the media element may choose to use the higher quality data since a seek might imply flushing the track buffer and the user expects a break in playback. When a new media segment is appended, memory constraints may cause previously appended segments to get evicted from the source buffer. The eviction algorithm is implementation dependent, but segments that aren't likely to be needed soon are the most likely to get evicted. The buffered attribute allows the web application to monitor what time ranges are currently buffered in the source buffer. For some use cases like ad-insertion or seamless playlists, the web application may want to insert a media segment in the presentation timeline at a location that is different than what the internal timestamps indicate. This can be accomplished by using the timestampOffset attribute on the SourceBuffer object. The value of timestampOffset is added to all timestamps inside a media segment before the contents of that segment are added to the source buffer. The timestampOffset applies to an entire media segment. An exception is thrown if the application tries to update the attribute when only part of a media segment has been appended. Both positive or negative offsets can be assigned to timestampOffset. If an offset causes a media segment timestamp to get converted to a time before the presentation start time, playback will terminate with a MediaError.MEDIA_ERR_DECODE error. Here is a simple example to clarify how timestampOffset can be used. Say I have two sounds I want to play in sequence. The first sound is 5 seconds long and the second one is 10 seconds. Both sound files have timestamps that start at 0. First append the initialization segment and all media segments for the first sound. Now set timestampOffset to 5 seconds. Finally append the initialization segment and media segments for the second sound. This will result in a 15 second presentation that plays the two sounds in sequence. ended The source is still attached to a media element, but endOfStream() has been called. Appending data to SourceBuffer objects in this state is not allowed. Contains the subset of sourceBuffers that represents the active source buffers. If the value being set is negative or NaN then throw an INVALID_ACCESS_ERR exception and abort these steps. If the readyState attribute is not "open" then throw an INVALID_STATE_ERR exception and abort these steps. Run the duration change algorithm with new duration set to the value being set. append() and endOfStream() can update the duration under certain circumstances. If type is null or an empty string then throw an INVALID_ACCESS_ERR exception and abort these steps. If type contains a MIME type that is not supported or contains a MIME type that is not supported with the types specified for the other SourceBuffer objects in sourceBuffers, then throw a NOT_SUPPORTED_ERR exception and abort these steps. If the user agent can't handle any more SourceBuffer objects then throw a QUOTA_EXCEEDED_ERR exception and abort these steps. If the readyState attribute is not in the "open" state then throw an INVALID_STATE_ERR exception and abort these steps. Run the duration change algorithm with new duration set to the highest end timestamp across all SourceBuffer objects in sourceBuffers. Notify the media element that it now has all of the media data. Playback should continue until all the media passed in via append() has been played. Run the steps of the resource fetch algorithm. If sourceBuffer is null then throw an INVALID_ACCESS_ERR exception and abort these steps. If sourceBuffer specifies an object that is not in sourceBuffers then throw a NOT_FOUND_ERR exception and abort these steps. Remove track information from audioTracks, videoTracks, and textTracks for all tracks associated with sourceBuffer and queue a task to fire a simple event named change at the modified lists. If sourceBuffer is in activeSourceBuffers, then remove it from activeSourceBuffers and queue a task to fire a simple event named removesourcebuffer at activeSourceBuffers. Remove sourceBuffer from sourceBuffers and queue a task to fire a simple event named removesourcebuffer at sourceBuffers. sourceopen Event When readyState transitions from "closed" to "open" or from "ended" to "open". sourceended Event When readyState transitions from "open" to "ended". sourceclose Event When readyState transitions from "open" to "closed" or "ended" to "closed". If the resource fetch algorithm absolute URL matches the MediaSource object URL, run the following steps right before the "Perform a potentially CORS-enabled fetch" step in the resource fetch algorithm. Allow the resource fetch algorithm to progress based on data passed in via append(). Set the duration attribute to NaN. The media element waits for the necessary media segments to be passed to append(). The web application can use buffered to determine what the media element needs to resume playback. The media element feeds data from the media segments into the decoders until the new playback position is reached. The following steps are periodically run during playback to make sure that all of the SourceBuffer objects in activeSourceBuffers have enough data to ensure uninterrupted playback. Appending new segments and changes to activeSourceBuffers also cause these steps to run because they affect the conditions that trigger state transitions. The web application can monitor changes in HTMLMediaElement.readyState to drive media segment appending. If this is the first transition to HAVE_METADATA, then queue a task to fire a simple event named loadedmetadata at the media element. Playback is suspended at this point since the media element doesn't have enough data to advance the timeline. During playback activeSourceBuffers needs to be updated if the selected video track, the enabled audio tracks, or a text track mode changes. When one or more of these changes occur the following steps need to be followed. If the current value of duration is equal to new duration, then abort these steps. Remove all media data with timestamps that are greater than new duration from all SourceBuffer objects in sourceBuffers. This preserves audio frames that start before and end after the duration. The user agent must end playback at duration even if the audio frame extends beyond this time. Indicates what TimeRanges are buffered in the SourceBuffer. If this object has been removed from the sourceBuffers attribute of the parent media source then throw an INVALID_STATE_ERR exception and abort these steps. Return a new static normalized TimeRanges object for the media segments buffered. On getting, the initial value or the last value that was successfully set is returned. If this object has been removed from the sourceBuffers attribute of the parent media source, then throw an INVALID_STATE_ERR exception and abort these steps. If the readyState attribute of the parent media source is not in the "open" state, then throw an INVALID_STATE_ERR exception and abort these steps. If this object is waiting for the end of a media segment to be appended, then throw an INVALID_STATE_ERR and abort these steps. If the readyState attribute of the parent media source is not in the "open" state then throw an INVALID_STATE_ERR exception and abort these steps. The media element aborts parsing the current segment. If the append state equals PARSING_MEDIA_SEGMENT and the input buffer contains some complete coded frames, then run the coded frame processing algorithm as if the media segment only contained these frames. Appends segment data to the source buffer. If data is null then throw an INVALID_ACCESS_ERR exception and abort these steps. If the readyState attribute of the parent media source is in the "closed" state then throw an INVALID_STATE_ERR exception and abort these steps. Queue a task to fire a simple event named sourceopen at the parent media source . If data.byteLength is 0, then abort these steps. Run the segment parser loop. If start is negative or greater than duration, then throw an INVALID_ACCESS_ERR exception and abort these steps. If end is less than or equal to start, then throw an INVALID_ACCESS_ERR exception and abort these steps. Let next random access point timestamp be the timestamp of the next random access point, for this track, that is greater than or equal to end. next random access point timestamp can be different across tracks because the dependencies between coded frames within a track are usually different than the dependencies in another track. Remove all media data, for this track, that contain starting timestamps greater than or equal to start and less than the next random access point timestamp. The input buffer is a byte buffer that is used to hold unparsed bytes across append() calls. The buffer is empty when the SourceBuffer object is created. If the input buffer starts with bytes that violate the byte stream format specifications, then call endOfStream("decode"), and abort this algorithm. Remove any bytes that the byte stream format specifications say should be ignored from the start of the input buffer. If the beginning of the input buffer indicates the start of an media segment, set append state to PARSING_MEDIA_SEGMENT. Return to the top of the loop. If the input buffer does not contain a complete initialization segment yet, then exit the loop. If the input buffer does not contain a complete media segment header yet, then exit the loop. Implementations may choose to implement this state as an incremental parser so that it is not necessary to have the entire media segment before running the coded frame processing algorithm. Run the coded frame processing algorithm. Incremental parsers should only do this transition after the entire media segment has been received. Add an AudioTrack and mark it as enabled. Add a disabled AudioTrack for each audio track in the initialization segment. Add a VideoTrack and mark it as selected. Add a disabled VideoTrack for each video track in the initialization segment. Add a TextTrack for each text track in the initialization segment. If the text track mode is "showing" or "hidden" then add this SourceBuffer to activeSourceBuffers. Let presentation timestamp be a double precision floating point representation of the coded frame's presentation timestamp. Let decode timestamp be a double precision floating point representation of the coded frame's decode timestamp. If the presentation timestamp or decode timestamp is less than the presentation start time, then call endOfStream("decode"), and abort these steps. Add the coded frame with the presentation timestamp and decode timestamp, to the source buffer. If the media segment contains data beyond the current duration, then run the duration change algorithm with new duration set to the maximum of the current duration and the highest end timestamp reported by HTMLMediaElement.buffered. If mediaSource is NULL the return null. This algorithm is intended to mirror the behavior of the File API createObjectURL() method with autoRevoke set to true. This section specifies what existing attributes on the HTMLMediaElement should return when a MediaSource is attached to the element. Let intersection range be the intersection of the active ranges. Let highest end time be the largest end time in the active ranges. Let highest intersection end time be the highest end time in the intersection range. If the highest intersection end time is less than the highest end time, then update the intersection range so that the highest intersection end time equals the highest end time. The bytes provided through append() for a SourceBuffer form a logical byte stream. The format of this byte stream depends on the media container format in use and is defined in a byte stream format specification. Byte stream format specifications based on WebM and the ISO Base Media File Format are provided below. If these formats are supported then the byte stream formats described below must be supported. A byte stream format specification may define initialization segments and must define media segments. Initialization segments are an optimization. They allow a byte stream format to avoid duplication of information in Media Segments that is the same for many Media Segments. Byte stream format specifications need not specify Initialization Segment formats, however. They may instead require that such information is duplicated in every Media Segment. This section defines segment formats for implementations that choose to support WebM. A WebM initialization segment must contain a subset of the elements at the start of a typical WebM file. The initialization segment must start with an EBML Header element, followed by a Segment header. The size value in the Segment header must signal an "unknown size" or contain a value large enough to include the Segment Information and Tracks elements that follow. A Segment Information element and a Tracks element must appear, in that order, after the Segment header and before any further EBML Header or Cluster elements. Any elements other than an EBML Header or a Cluster that occur before, in between, or after the Segment Information and Tracks elements are ignored. A WebM media segment is a single Cluster element. The Timecode element in the Cluster contains a presentation timestamp in TimecodeScale units. The Cluster header may contain an "unknown" size value. If it does then the end of the cluster is reached when another Cluster header or an element header that indicates the start of an WebM initialization segment is encountered. Block & SimpleBlock elements must be in time increasing order consistent with the WebM spec. If the most recent WebM initialization segment describes multiple tracks, then blocks from all the tracks must be interleaved in time increasing order. At least one block from all audio and video tracks must be present. Cues or Chapters elements may follow a Cluster element. These elements must be accepted and ignored by the user agent. A SimpleBlock element with its Keyframe flag set signals the location of a random access point for that track. Media segments containing multiple tracks are only considered a random access point if the first SimpleBlock for each track has its Keyframe flag set. The order of the multiplexed blocks must conform to the WebM Muxer Guidelines. This section defines segment formats for implementations that choose to support the ISO Base Media File Format ISO/IEC 14496-12 (ISO BMFF). An ISO BMFF initialization segment must contain a single Movie Header Box (moov). The tracks in the Movie Header Box must not contain any samples (i.e. the entry_count in the stts, stsc and stco boxes must be set to zero). A Movie Extends (mvex) box must be contained in the Movie Header Box to indicate that Movie Fragments are to be expected. The initialization segment may contain Edit Boxes (edts) which provide a mapping of composition times for each track to the global presentation time. An ISO BMFF media segment must contain a single Movie Fragment Box (moof) followed by one or more Media Data Boxes (mdat). The Movie Fragment Box must contain at least one Track Fragment Box (traf). The Movie Fragment Box must use movie-fragment relative addressing and the flag default-base-is-moof must be set; absolute byte-offsets must not be used. External data references must not be used. If the Movie Fragment contains multiple tracks, the duration by which each track extends should be as close to equal as practical. The first sample in each Track Fragment Run Box (trun) must indicate that the sample is a random access point. The Media Data Boxes must contain all the samples referenced by the Track Fragment Run Boxes (trun) of the Movie Fragment Box. A random access point as defined in this specification corresponds to a Stream Access Point of type 1 or 2 as defined in Annex I of ISO/IEC 14496-12. // Append media segments from the new playback position.